To listen to this free angel message, simply click the link below… Alternatively to save to your computer, right click the link (ctrl click mac)… Or press and hold on phone/ tablet. Greetings from Archangel Metatron and indeed your team of guides, angels, and loved ones in spirit. And as you let your mind become calm and you shift your awareness within, you are able to tune into your oneness and interconnectedness with everything, with God, Source, the Universe, All That Is. Recognize that you are not separate, you are one. And thereby, returning to the perspective and awareness of love, you transcend illusion, you release the layers, the clouds and the chaos created by remaining solely in illusion. And you witness the underlying strength, beauty and peace of being in alignment with your oneness with God, with love, with the universe, with everything. The illusion of the physical is persistent. The duality created by the mind is strong. The events and hardships and challenges of life pull you back into the illusion which feels real, which looks real, but is not the highest truth from which you are able to view your experience. The highest truth is oneness with God, with Creative Source, with Love. And you are able to always experience this, and it changes everything. It changes your perception, it changes how you feel. It changes how you view yourself, how you relate to others, and it changes what manifests and unfolds in your life. There is of course the ability to logically know about oneness and about love. And then, there is the ability to experience, which we are most interested in, and invite you into now. Experience the real, vivid, blissful, uplifting experience of your oneness with God's love, with universal love, with Source light that is made possible right now as you relax, breathe and shift your awareness within. It is as if your awareness is entering into the portal of your heart. Shifting your awareness inside as light frequency now surrounds you, and the vibration of love uplifts you. Your team of guides and angels and your higher self indeed, serve and support you now in lifting in vibration, lifting into the experience of the higher realms, into the higher vibrations of love. You are lifting in light. And as you simply relax in this vibration of love, you are able to lift. You are able to fly from right where you are – right here and right now. By lifting in vibration, you are able to float up energetically – becoming lighter and brighter, flying up into the higher spiritual realms, into the fifth, ninth and twelfth dimension now. Lift into your authentic state, lift into vibrational resonance with your highest self, with your truth as a vibrant spiritual being, one with all existence, one with the universe, one with the center of the galaxy, one with the divine, one with the angels, the ascended masters, one with creative source, God. Experience this. Relax into this. Continue lifting higher and as you do, lifting up and out of the experience of suffering, of the experience of spiraling thought of negativity, of dense energy and feeling heavy, it’s as if you lift through a screen of light and you rise above the screen, but all that is lower in vibration stays below. Any lower vibrational energies are wrapped in a net of light and released and dissolved into the light of love. And you lift higher. You lift into more source light. You lift into a greater resonance with God. 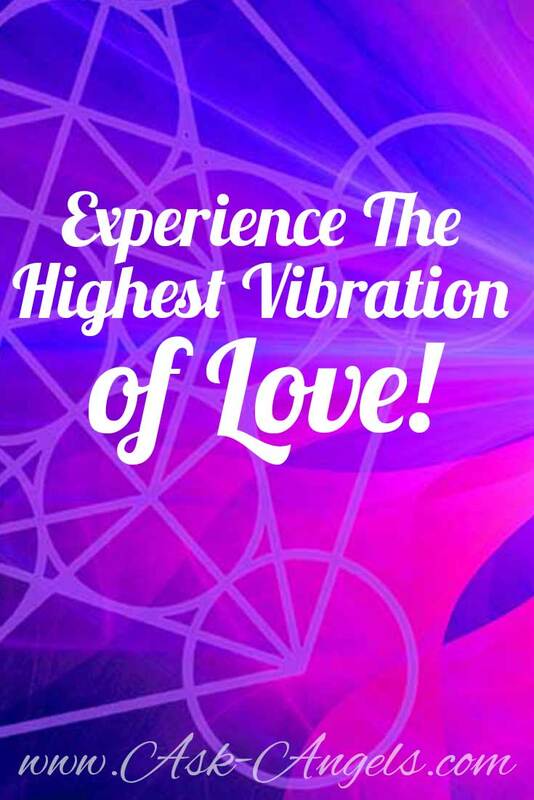 You lift into the highest vibration you can experience now – the vibration of God, the vibration of Source, the vibration of Oneness, the highest vibration of love. Lift into this, float up, fly up, lift up way into this light. Breathe the light and love in… It is all around you. It is within you. And as you exhale, envision yourself letting go of anything else that was weighing you down, so that you breathe in light and you exhale any remaining lower vibrations which automatically elevates you higher, so that you're shining brighter, so that you’re positively glowing from within. A column of light flows along your spine. You’re filled with light from the inside out. This column of light extends far above your head and far below your feet. It is expanded out around your entire physical vessel and it encompasses all that you are – your entire spirit, your entire oneness with all. The light that originates from within you touches and illuminates everything. The light of God, the light of love, so brightly shining within you shines through everything. Notice from this higher perspective, from this higher vibrational state that you are able to see God’s light and love in everything. Yes, there are those who are blocking the connection with the light through layers of density, negativity and illusion. But even then, the light remains within. And in this moment, you are able to see and perceive and experience that you’re consciously returning to awareness, to a higher vibrational state, to oneness with God's love. Burning through the layers of illusion you had been carrying allows clarity, allows your inner God light to illuminate your surroundings, to lessen the burden of another. For again, this is the truth, the love, the light, the presence of God in everything. But as a collective, you have built up a massive cloud blocking the light of the sun. And so, you’re consciously bringing the light of the sun within you – glowing as the brilliant orb of sunshine and God light. You dissolve the cloud cover in your own life – allowing clarity of God light to shine through you, restoring your action and bringing action into alignment with love, releasing the cloud and spiral of negative thought, of limiting belief, of obstacle, of challenge, of judgment, letting this all go, letting the paradigm of judge and victim go and witnessing the underlying truth – Divine love, living as your enlightened self, aware of your oneness and actively choosing to embody divine presence. Keep lifting in light and glowing with love to positively transform your life and lives of others. Keep following your heart, listening to your inner divine guidance,and acting as you are inspired and releasing the limitations of the illusion. Let God's light shine through you to dissipate the clouds of thought and density, restoring vibrant love in your life, and on the planet… Love is your authentic truth that you are meant to enjoy. Love is the truth that you authentically are.There's a ripple of this love energy flowing out from beyond you now, flowing around the globe, around the universe, around the galaxy. Each time you return to love, this ripple repeats iteself. Each time you shine your unique light a little brighter, the vibration of the planet increases. Remember to return to love. And as you now become aware of yourself in your physical body once again – feeling your fingers and toes, your hands and feet, think or say “Yes” to allow a waterfall, a tidal wave of God’s light to flow down upon you. The full presence of the divine, the light of God, Christ consciousness, enlightened love flows down all around you now – downloading into your being. You experience this coming in through your upper chakras, your soul star, your crown, brow, throat, heart, solar plexus, sacral, root, earth chakra. Embody the light. Let love shine around and within. Let your vibration be raised. Let love flow within and out. Continue allowing the brilliance of divine light and love that is your truth to shine through all that you do. Let God's light and love shine through all that you are, all that you think, speak and act upon. You are realigned with this love of God now… Your authentic truth is restored. You are the vibration of love. P.S. Enjoy this message! Comment below and let us know, or pass the love on by sharing! Have a blog, website or community you'd like to share this post with? Thank you and blessings to you Melanie. Your messages so speak to my heart especially this latest one! Thank you & God Bless! Love & light! Separation is an illusion. I did not realize this until your message. Soothing, inspiring, relaxing message. Thank you, Melanie. Beautiful…thank you, Melanie, and Blessed Holidays to you. Thankyou very much for this beautifull meditation. Melane God and angels ever bless you in this journey. Thank you Soooo much for all of your beautiful comments on this message! Happy Holidays to you and I am so glad to hear you love it! Thank you, Melanie, for your beautiful and magnificent gift. You are an angel! Thank you sincerely, Melanie, for your wonderful Christmas gift. It is beautiful! Thank you Melanie, was very good. Happy Holidays! Thank you for sharing this lovely Holiday meditation, What a beautiful and special full moon message. You are a shining light! Thank you so much Melanie. Xoxo. Today is my birthday and it is/was filled with a tinge of sadness. Thanks to this, I was reminded and able to release these energies. A powerful meditation and I thank you.